"Absolutely riveting . . . Essential reading for foodies, java-junkies, anthropologists, and anyone else interested in funny, sardonically told adventure stories." 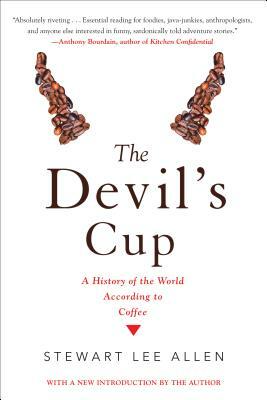 Full of humor and historical insights, The Devil’s Cup is not only ahistory of coffee, but a travelogue of a risk-taking brew-seeker. In this captivating book, Stewart Lee Allen treks three-quarters of the way around the world on a caffeinated quest to answer these profound questions: Did the advent of coffee give birth to an enlightened western civilization? Is coffee the substance that drives history? From the cliffhanging villages of Southern Yemen, where coffee beans were first cultivated eight hundred years ago, to a cavernous coffeehouse in Calcutta, the drinking spot for two of India’s Nobel Prize winners . . . from Parisian salons and cafés where the French Revolution was born, to the roadside diners and chain restaurants of the good ol’ USA, where something resembling brown water passes for coffee, Allen wittily proves that the world was wired long before the Internet. And those who deny the power of coffee (namely tea drinkers) do so at their own peril. Stewart Lee Allen's books on how food and drink shape human society have been translated into fifteen languages. He currently lives in Manhattan. "Stewart Lee Allen is the Hunter S. Thompson of coffee, offering a wild, caffeinated, gonzo tour of the World of the Magic Bean. His wry, adventurous prose delights, astonishes, amuses, and informs."